You are a kakapo, the flightless species of parrot native to New Zealand, and your species is endangered! 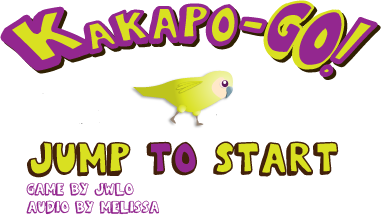 Play as Kakapo Joe, on his quest to find a girl who is willing to mate. Since female kakapo only mate every 5 years, his is no easy quest. But, with your help, and the power of the magical rainbow jumping feathers, Joe can reach new heights (and new ladies)! Can you find the secret mode? If you'd like to learn more about the kakapo, I encourage you to look it up and, if you'd like, to support its conservation. 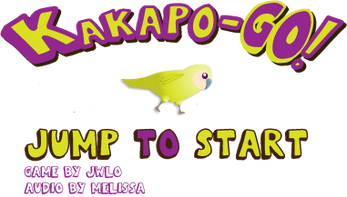 Kakapo-GO is a short game I created for the Northeastern University Game Development Club's 4th annual Columbus Day Game Jam. In a jam that lasted 44 hours, I created all the art assets and code for this game, while my roommate Melissa created the audio. Special thanks to Billy and Benno for teaching me about singletons and coroutines. This game was inspired by Nitrome's J-J-Jump. Please note that this is a prototype of what I can make given two days to work with no prior planning. By working mostly on my own, I challenged myself to solve problems independently, but I also spread myself pretty thin. If I were to revisit this game, besides polishing up the art style and creating more robust levels, I would add new obstacles to the levels to create unique, puzzle-oriented challenges.